Christine runs the Artists Against Windfarms website and supports artists and groups fighting to preserve the countryside and wild places from industrial sized wind turbines in England, Wales, Scotland, Ireland, Kansas, Vermont and the rest of the world. 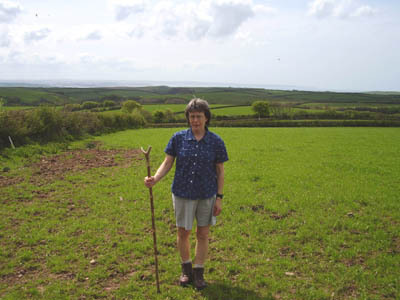 Christine`s walk round Devon wind farm sites, May 2006 and her Exhibition following it, July 2007 "A walk round Devon"
This page was made in 2006-2007, with a 2008 update. Links on the right give more up to date news on the situation in Devon now, as do Blog and Facebook postings. We are winning the battle as far as public opinion is concerned, as latest council election results show, but Labour/Conservative/Lib Dem leaderships remain wedded to Big Wind and have made the fight to stop wind turbines through the Planning System more and more difficult. This website is, and will always remain, non-political. We welcome and show work from artists of all political persuasions, but we also feel it is right to recognise that the rise in popularity of the only political party that opposes wind energy, UKIP, is at least in part a democratic response to the failure of the other three main UK parties to address this issue. I live in Barnstaple, North Devon and I paint landscapes in pastel, acrylic, oil and (rarely) watercolor. My paintings all grow out of walks that I take in the countryside, which is why so many of them have paths winding into the picture. I am very interested in the texture of grasses and leaves, water and sky. I want my paintings to feel real, so that you can imagine walking into them, feeling the earth beneath your feet as you do so. My paintings are also about places that mean something to me. This is Marleycombe Down, in Bowerchalke, Wiltshire, my most favourite hill of all. When I worked for my father, James Lovelock, in the 1970`s I used to walk over Marleycombe with him most days, and he would talk about the idea he had that the Earth was a self-regulating system (Gaia). As a family we have always cared about the environment, and I like to think of myself as a "Green Artist" - I don`t drive a car, and use public transport nearly all the time. Nearly all my trips to wind farm sites have been on foot, or by bus, coach or train. This is a photo of me at the time I was working in the "family business", with the statue of Gaia in the garden in Bowerchalke. The footpath in the painting "Marleycombe from the footpath" is just above the hedge. One of my jobs was to take sunphotometer readings (all to do with Global Dimming although no one called it that, then) I also helped enter chlorofluorocarbon data from the Shackleton into our (then) state of the art computer. I was an athlete in those days (running under my then married name of Curthoys) and South Western Champion at 800, 1500, 300 and Cross Country. I ran the fastest laps in the National Road Relays in 1973 and 1976, competed internationally and later (after having three children) won the World Veterans 10K Road Race Championships (Overall winner). It was great competing, but what I loved most about running were the early morning runs over Marleycombe and into the woods of Verndtch Chase. I used to see paintings in my mind that I wanted to do, and I am working on some of them now, many years later. This painting is of Hungry Hill in Bantry Bay, West Cork, my favourite mountain. It may not be very high, but it is impressive, rising straight up from the bay. My parents bought a bungalow here in the 1960`s and it was during the long summer holidays then - when not climbing Hungry Hill - that my father started looking for industrial tracers in the haze that came from Europe. His electron capture detector was so sensitive that it discovered CFCs not only in the haze, but in the clean Atlantic air.. Eventually the bungalow became an atmospheric monitoring station, run for many years by Michael O`Sullivan, and. I carried on handling the data from it until 1986. This is a very old photo of my father and me, up on Hungry Hill. He was taking air samples. If I remember correctly, he then flew to America with them, and there was some amusement at US Customs about containers filled with "fresh air from Ireland". Hungry Hill is a marvelous mountain to climb, made of Old Red Sandstone, the slabs of rock often at just the right angle so that you can run up them. From the summit you can see both of the adjacent peninsulas and you feel as if you are on top of the world. This is the view from Mill Street In Great Torrington, another of my favourite places. I lived in Torrington from 1986 until 1998, and walked on Castle Hill nearly every day. The town itself is built on the hill, and surrounded mostly by common land. It is made of the same kind of rock as Hungry Hill. Walking down the hill in springtime, when the air was rich with the coconut smell of gorse, I often felt as if I was in Ireland again. This painting is called "July, Manning`s Pit". Manning`s Pit is the field just beside my house in Pilton, Barnstaple. I have done many paintings of it, and Tutshill Woods nearby. I live on the edge of the town, so I am lucky enough to be able to walk out into the countryside each day. The Fullabrook Down Wind farm is over the hill in this painting. It isn`t close enough to effect me personally, but having walked those hills, I know that they mean as much to the people who live there as Marleycombe, and Castle Hill and Hungry Hill.mean to me.